One of the summer’s biggest blockbusters, Crazy Rich Asians follows an unwarned Rachel Chu as she is thrust into the lives of Singapore’s elite. Her boyfriend, Asia’s most eligible bachelor Nicholas Young, invites her to attend his best friend’s wedding and visit his overbearing family. Unbeknownst to her, Rachel and Nick come from very different backgrounds. An economics professor born in Los Angeles, Rachel was raised by a single mother who waited tables just to make ends meet and provide for her daughter as best she could under certain circumstances. Nick comes from one of the ten richest families in Asia and is supposedly the sole inheritor of that wealth. While the plot of Crazy Rich Asians is certainly interesting, the costume is also worth discussing. Over time, Rachel’s style evolves from budget-friendly to chic and fabulous. In the beginning of the film, Rachel greets her friend Peik Lin in a simple red dress—although the dress is supposed to be reminiscent of a cheaper ensemble, it is actually a dress made by Miu Miu. Peik Lin’s eyes widen when she hears that Rachel does not plan to change to meet Nick’s family. 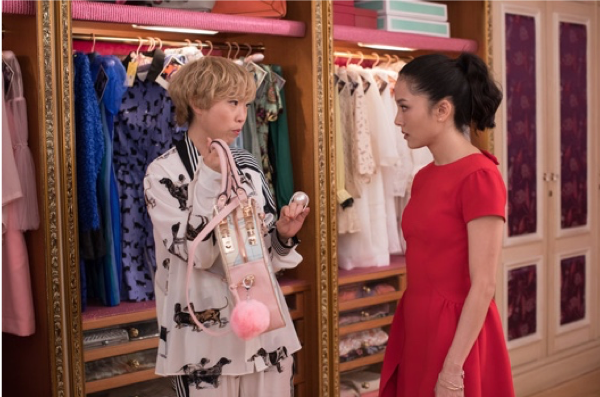 In her enormous closet, Peik Lin pulls out a gorgeous Missoni gown for Rachel to wear that evening in order to fit in among Nick’s extravagant family. Overthe course of the film, Rachel has several run-ins with Eleanor, Nick’s mother, who makes sure that Rachel is aware of her disapproval of her. Rachel is so hurt by Eleanor’s words that she almost gives up on Nick and returns home, but Peik Lin encourages her to stand up to Eleanor. Before the wedding, Rachel enlists Peik Lin to help her choose a dress to wear to the event. It was entertaining to watch this scene because Rachel tries on several designer dresses before she decides on a blue Marchesa gown. When Rachel waltzes into the ceremony, she looks confident and puts all the other women, including Eleanor, to shame. Peik Lin, however, is everything that the Young family is not. She comes from new money, and everything is very ostentatious. Her style is loud and in your face. Peik Lin and her family like to flaunt their money. They would probably seek out opportunities just to mention who makes their clothing. Although her clothing is very expensive, Eleanor Young’s wardrobe is subtler than that of those who come from new money, like Peik Lin’s family. Eleanor would never wear anything with logos because she does not want people to identify the labels she is wearing. Nick’s family shies away from the media and lives low-profile lives. Most of her wardrobe is made up of bespoke clothing and couture pieces. This type of fashion is of the highest quality because the items are made specifically for the individual who is wearing them. A good example of the type of clothing Eleanor wears lies in the dress she wears to the wedding. The look is mature, and it achieves her goal of blending in with the masses—I did some research and learned that it is an Elie Saab dress. My favorite outfit that Eleanor wears in the film is a white and navy pinstripe suit by Armani. Astrid Leong Teo, Nick’s cousin, is known throughout Asia for her sense of style. She never ceases to impress in her ensembles. Like Eleanor, Astrid’s character wears beautiful clothing, jewelry, and clothes that are subtle and not logo-centric. In Astrid’s first scene in the film, she is seen shopping. She is wearing a pink knee-length dress by Christian Dior. In the scene, she examines a pair of earrings. The jeweler tells her that it means a lot to him when she wears his pieces, so he offers to give them to her for the same price he originally paid for them. This is supposed to be a good deal, but they still come out to over a million dollars. Without any hesitation, she buys them. Obviously Astrid shells out a lot of money on her wardrobe, but you would never know just how much without seeing the behind-the-scenes aspect of it. Often, the hard work that goes into costume design on a movie is overlooked. 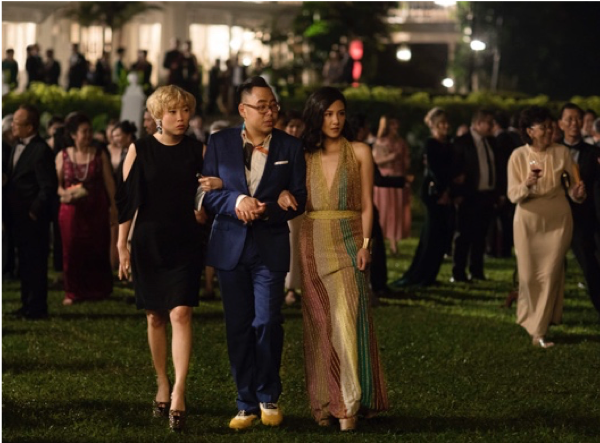 Crazy Rich Asians deserves all of its critical acclaim, and its wardrobe choices—which speak volumes to the characters—deserve a second look.